USDA’s Natural Resources Conservation Service has provided $740,000 to DeSoto County through Emergency Watershed Protection Program (EWP) assistance to help to repair hurricane damage a popular park in Arcadia, Fla.
Hurricane Irma struck Southwest Florida as a Category 3 in fall 2017. The hurricane dropped from 10 to 15 inches in the Peace River drainage area, which covers 1,367 square miles. The Peace River gage at Arcadia recorded a peak discharge of just more than 20,000 cubic feet per second. This peak discharge was associated with a crest of 19.20 feet, the third highest recorded. Flood stage on the river is 11 feet. With all the rainfall, one of the hardest hit areas along the Peace River was Morgan Park. The duration of flow and the high volume eroded the eastside of the park and threatened the park entrance. 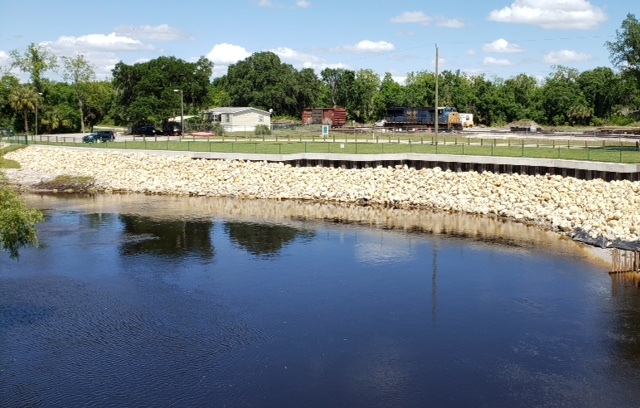 NRCS funding installed about 370 linear feet of sheet-pile wall and 2,000 tons of riprap to prevent future erosion of the riverbank and protect the park’s infrastructure for public use. Workers finished repairs the last week of March. DeSoto County administrator Mandy Hines said the park has always been a popular spot for runners, walkers and outdoor enthusiasts. “Now, thanks to NRCS for its funding assistance, the park will be enjoyed for many generations to come,” she said. The Emergency Watershed Protection Program can help relieve imminent hazards to life and property caused by floods, fires, wind­storms and hurricanes. Aid may include financial and technical assistance to remove debris from streams, protect destabilized stream banks and establish cover on critically eroding lands, repair conservation practices and purchase flood plain easements. The public and private landowners are eligible for assistance, but must be represented by a project sponsor, such as a city, county, conservation district or a Native American tribe or tribal organization. NRCS provides technical assistance and pays up to 75 percent of the construction. Local sources contribute the remaining portion in the form of cash or in-kind services. The process begins when the sponsor requests assistance from a local NRCS office. Staff visit the site and determine eligibility based on environmental impacts and economic analysis, then request funding from the NRCS national office. If Congress appropriates funds, the sponsor enters into a cooperative agreement to complete the work.